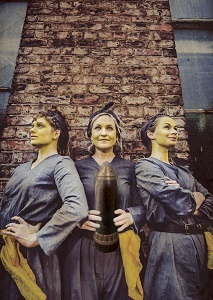 Meet Agnes, Anne and Betty, a motley crew of munitions workers 'doing their bit' for the war. They make bombs. Factory life seems perfect until an air raid sends them on an explosive journey through euphoric emancipation, forbidden friendships and anarchic dreams. Canary was created in collaboration with the award winning Teatro En Vilo. Seamlessly combining high quality physical theatre with contemporary sound design, the show offers audiences a rare insight into life during the First World War from the unique perspective of Britain’s munitions workers, The Canary Girls. Join Fun in the Oven Theatre as they celebrate and commemorate the lives of Britain’s unsung war heroes. Fun in the Oven Theatre is a physical theatre company based in Newcastle Upon Tyne. Founded in 2015, they are fast becoming the North East's leading company for physical theatre through delivery of shows, workshops and events. The company’s distinctive style combines sharp physical theatre and contemporary sound design to create dynamic shows that capture our audiences’ hearts and minds. "My favourite theatre experience of the year"
"Three hugely versatile actors held us spellbound"